Description: Red Knots are robin-sized, with short, olive, dark gray or black legs and a short, black bill. They are bright rufous below with black, white and gray patterning on their wings and back during the breeding season. 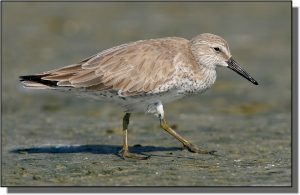 In the nonbreeding season, knots become nondescript light gray sandpipers with barring on their flanks. They appear chunkier and flatter than most other sandpipers. In flight, white wing linings and gray barred rumps are characteristic. Similar Species: Sanderlings, Dunlins or the rare Curlew Sandpiper can offer some confusion. Sanderlings are smaller and whiter in nonbreeding plumage and in breeding plumage have a white belly. Red Knots are chunkier with a shorter, straight bill than Dunlins and Curlew Sandpipers. Comments: Red Knots breed on the arctic tundra and winter along coastal sandy beaches, mudflats and interior lakes and reservoirs. Like Ruddy Turnstones, Red Knots often fly without stopping across the central Great Plains during migration. They are usually not found in large flocks within the central portion of the region. A visit to Delaware Bay on the Atlantic coast during spring migration is an awe-inspiring phenomenon as tens of thousands of Red Knots feed on horseshoe crab eggs with Ruddy Turnstones, Semipalmated Sandpipers and Sanderlings.